All admire the noble lady in her fine silks and rich adornment, but she herself envies the country lass in simple, comfortable garb. Live the best of both in this refined top. 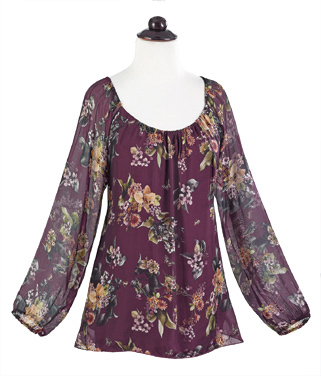 Regal silk-blend organza strewn with floral bouquets on a deep-burgundy background flows in a loose fit with peasant neckline and gathered sleeves. Fully lined in stretchy knit. Viscose/silk; lining is viscose/elastane. Hand wash. Sizes S-XL. Made in Italy.